Local artist Curtis Van Charles Sorensen has created the next temporary art installation in the East Village. Walk the RiverWalk and see beavers, birds and foxes on the bridge abutments (and soon) on the walls of the public washrooms. 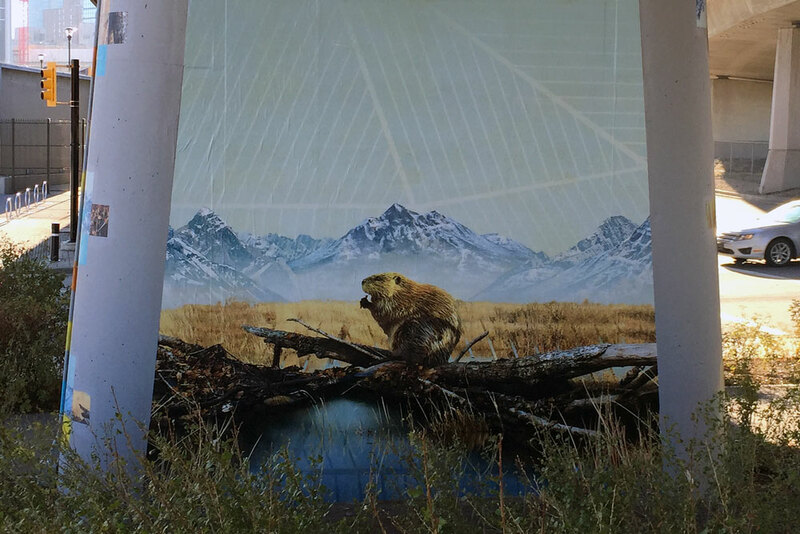 For the next two years, you’ll be sharing the RiverWalk with hyper-real, larger-than-life beavers, birds and foxes. Curtis Van Charles Sorensen is the local artist behind the latest temporary art installation on the RiverWalk. He’s created a window into natural Alberta right in Calgary’s core, but he also incorporates elements of urban Calgary architecture. When you see it you’ll probably stop to think about the value of natural spaces in our city and what we can do to make sure they are protected. Nature has huge importance to Sorensen. He grew up in Saskatchewan, close to the river. “I spent all my free time there and I think that had a huge impact on who I am now,” says Sorensen. That certainly shows in his art style. 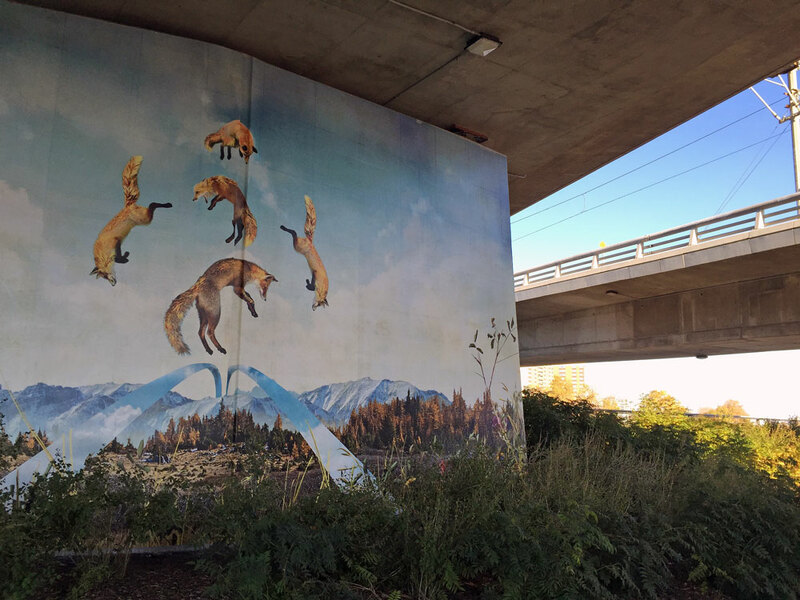 Sorensen calls himself a contemporary Canadian landscape and wildlife artist – maybe you’ve seen his work around the city in places like Ox and Angela, Frenchie Wine Bar and Junction 9. That is also the case in Sorensen’s East Village installation. It features various animals that call this area home, including a beaver, foxes and birds. And mountainous and grassy landscapes are depicted. The pieces also highlight the urban – you’ll see elements of Calgary architecture in the artwork, too. That’s because the installation isn’t just about nature. It’s about the city too. “We live in a wonderful city with great architecture,” says Sorensen. “These pieces highlight those elements.” When complete, the washroom and shed will focus primarily on architecture and nature will be secondary, a flipped version of the artwork on the abutments where nature is the primary focus and the architecture comes second. 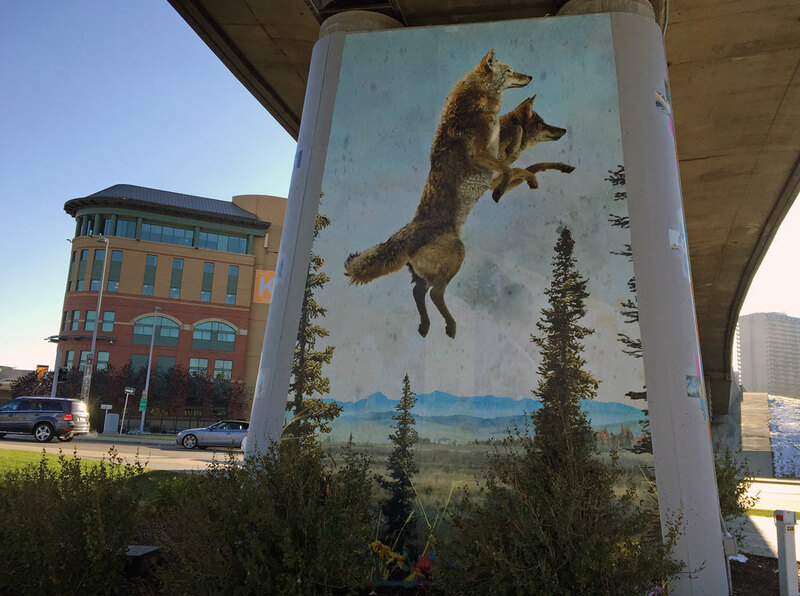 Sorensen hopes the work will encourage passersby to talk about animals and the environment and their importance to us, and think about how nature is all around us, even in an urban space. Sorensen also hopes it will spark conversations about the protection of nature and encourage interaction with it. What sets Sorensen apart from other landscape and wildlife artists is how he brings out nature in a real, immerse way. He does that through layering and creating his pieces like a collage. Sorensen draws from a collection of photographs from all over Alberta. He layers several photographs with several drawings – imagine Sorensen cutting and pasting digital photographs and drawings to create a collage. To create different tones and depth, Sorensen then paints on top of the collage. The installation of the bridge abutments took more than 10 days, and each day lasted up to 16 hours. The pieces have to be applied wet, and are rolled onto the abutments from top to bottom. The still-untitled installation covers three bridge abutments, and soon the two public washrooms and the maintenance shed across from the Simmons Building too. Completion of the installation is weather-dependent – the Thanksgiving snow set things back a little. Expect the installation to be fully complete before the end of the month. For more information on Sorensen and his artwork, visit vancharlesart.com. You’ll find this piece across the road from the East Village Experience Centre. 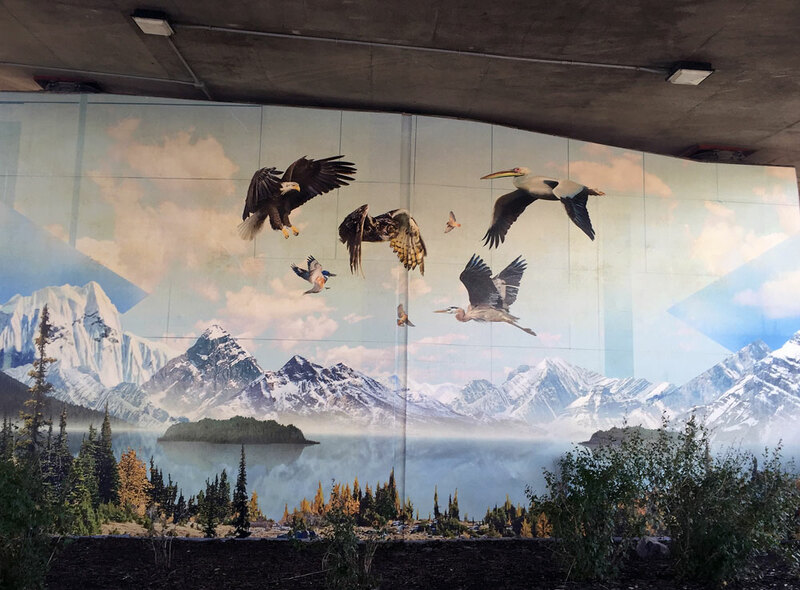 Sorensen hopes that the work encourages passersby to think about how nature is all around us, even in a big city, and helps us stop to appreciate natural spaces. The bushes in front of the bridge abutment blend into Sorensen’s work. It’s intended to be a realistic and immersive representation of nature and of urban spaces. 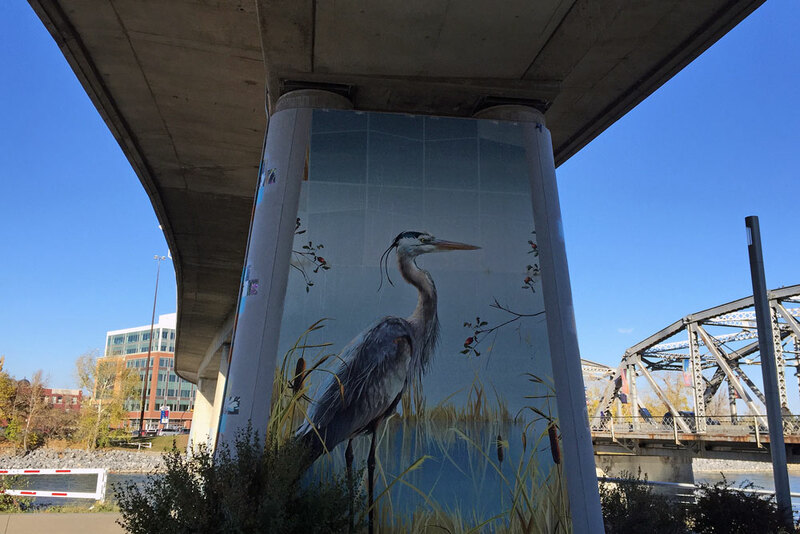 Look closely and you’ll see how Sorensen melds the natural and urban world. In the background, Sorensen includes the FIRST condos in the East Village. 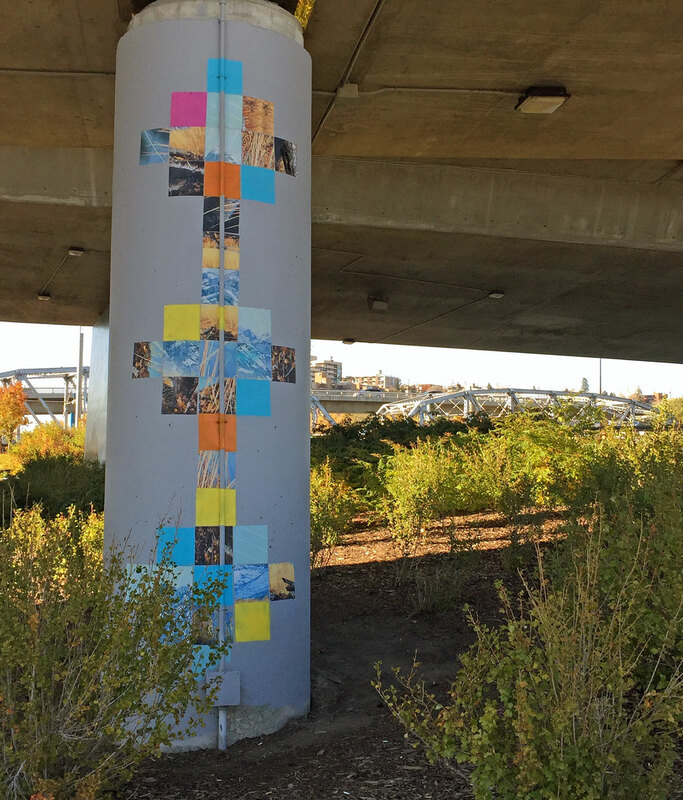 Sorensen used excess pieces from his work to create additional collages on the sides of the bridge abutments. In this piece, Sorensen incorporates the East Village’s George C. King Bridge along with natural elements. 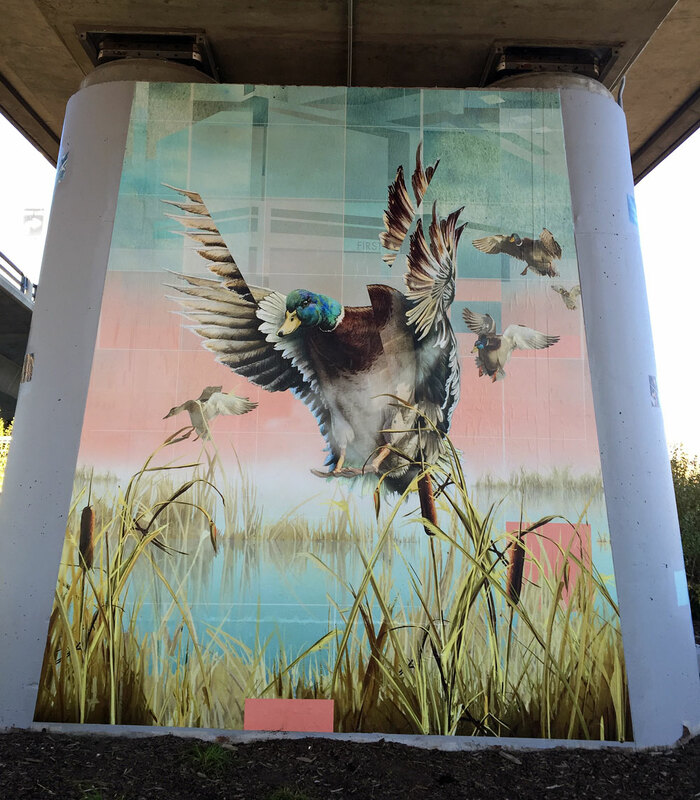 Sorensen’s work extends along the RiverWalk and past the Langevin Bridge.